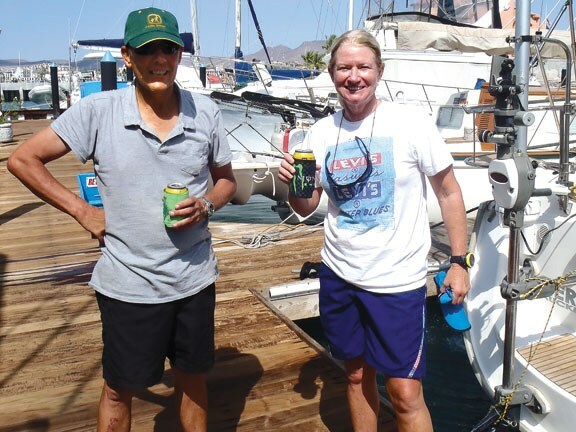 Trade-A-Boat editor, Steve Raea, returns to Mexico to rejoin the yacht he purchased last year and prepare for his second Pacific Ocean crossing. He backgrounds the purchase and the race to get sailing before the northern hemisphere hurricane season. Déjà vu is a funny thing, but there's no better way to describe sitting on a yacht at Mazatlan Marina on Mexico's west coast wondering what I'm doing here...again. I was here five or six years ago in very similar circumstances. I'd bought a yacht in San Diego and, with my partner, sailed the 1000 miles down the Pacific coast, arriving in Cabo San Lucas on New Year's Eve. It was the first leg of a Pacific crossing via the Marquesas Islands, Tahiti, Rarotonga, Tonga and finally south to Auckland. 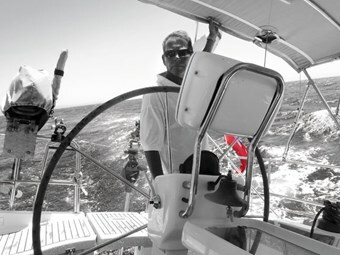 It was the perfect crossing with the wind on our backs and a following sea - Champagne sailing. The final bash south into Opua was a reminder of the realities of sailing in the sub-tropics. Despite the usual line-up of passing fronts, we arrived home unscathed and the boat - a staunch Kiwi-built, three-skin kauri 35-footer - showed no wear or tear after nearly 8000 offshore miles. The partner, however, couldn't get off fast enough and ran for the hills - never to be seen again. After completing formalities and handing over buckets of cash to NZ Customs for the privilege of returning a New Zealand-built yacht to her home waters, the boat was sold for a handsome profit. It was all too easy and I told myself that I would do all this again sometime in the future. But at the age of 45, and having always lived on yachts, it was time to wise-up and invest in my future. It was time to buy my first home. It was a big step for a salt like me, having become so comfortable and familiar with life on-board. But it needed to be done. That house would be a stone's throw from Auckland's Westpark Marina where, by and large, I had spent the last 10 years. It was the beginning of a five-year plan that had me selling up in 2014 and taking any capital gain back to the US where I would shop once more for my next offshore yacht. But the plan had a flaw and it was insurmountable. 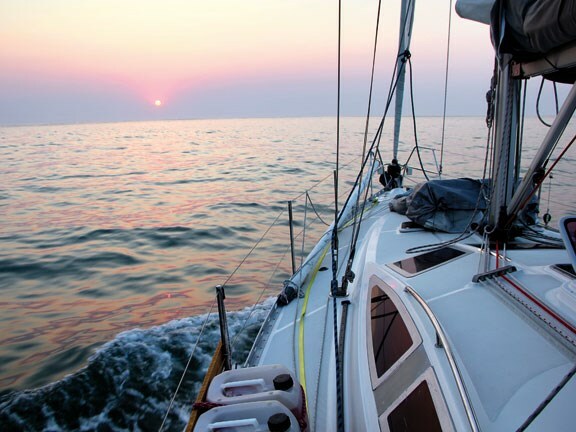 It meant no yacht and, while I endured two summers without much time on the water, there was no way that I could do a third and the decision was made to slash two years off the plan and sell up again. This took place in late January last year and the house sold at auction while I was sailing and reporting on a yacht race in the UAE. I arrived back in New Zealand in mid-February, one week before settlement. With a house lot of furniture, a needy cat and no place to go, it became obvious that it was time to find another boat to call home, and fast. The search began in earnest. With the experience gained from my previous offshore purchase, my knowledge bank was in reasonable shape and my priorities were a bit more clearly defined. The boat would be no smaller than 40 feet and no larger than 42 feet - marina prices offshore are steep. I wanted a production-built boat no older than 10 years and something that was preferably equipped for offshore cruising. This excluded ex-charter yachts, which carry a stigma and a price penalty back in New Zealand. I wanted to be able to recover my costs (at worst) and hopefully make a profit when I get it back to New Zealand. Lastly, the boat would have to be lying on the west coast of the US or Mexico. This would ensure a single-season passage home without the expense of having to transit the Panama Canal. Entering these criteria into the various boat search engines - boats.com, yachtworld.com and others - I first searched the US west coast - San Francisco, Seattle and San Diego - but turned up little, save for US-built Hunters and Catalinas. Late model European yachts are thin on the ground on the west coast and are expensive. I then looked to Baja, Mexico - La Paz, Mazatlan and Puerto Vallarta - where you can find well-equipped yachts sitting high and dry, all but abandoned by their American owners whose cruising dreams turned into living nightmares on the passage down from the US. This search turned up little but there was a listing that piqued my interest, more so because it was a European brand that I was unfamiliar with - a Delphia 40.3 built in Poland. Launched in 2008, it appeared a smart boat and was well-equipped with mechanical wind vane steering, water maker, Duogen wind turbine and a deep 7.5-foot lead fin keel. Being a two-cabin owner's version, it offered heaps of storage and had a large, optional, 55hp diesel with less than 500 hours on it. But what do the Polish know about boatbuilding and just who is Delphia? I discovered the Poles know quite a bit about boatbuilding and Delphia builds hulls and decks for some of the major German and French production yards. Good enough for me, so I dug a bit deeper. A simple Google search of the boat's name brought up some cruising notes on various sailing websites from which I was able to glean a bit of the boat's history and the owner's personal circumstances. As I suspected, the owner's cruising dreams had evaporated and they'd put the boat on the hard in La Paz and headed west. It had been on the market for almost a year and was over-priced. Armed with the little knowledge I had, I contacted their US-based broker with a 'take it or leave it' offer subject to survey and sea trial. The owners initially rejected my offer but came back a week later and accepted, just as the removal truck with the last of my possessions rolled out of my driveway. My next move was to contact an old Kiwi boatbuilder I had met in La Paz during my previous visit five years ago. At 82, Cecil Lange is an old school, kauri boatbuilder but has survived in Mexico for many years doing marine surveys. He makes no apology for his dislike of production yachts but they're his livelihood and he was happy to view the boat, to see if it was genuine, and report back. His email landed in my inbox two days later. A man of few words, his message was simple: "It's a good one. Call me." 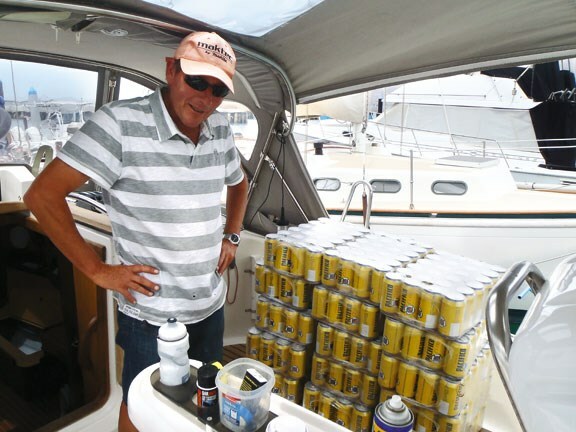 The next morning I had booked a one way flight to Mexico for me and five suitcases full of rigging spares, storm sails and chandlery collected over a lifetime of yachting. Having sat on the hard under the blazing Baja sun for just under a year without a hint of rain, Nereid looked truly awful. Brown, rust-coloured dust stains ran down her topsides and her cockpit was a mire of dust and dirt - it was difficult to determine the colour of her decks. But she looked a powerful yacht with her deep keel, balanced spade rudder and tall swept-back Selden rig. Below decks things didn't look a whole lot better. It was as if the owners had finished breakfast and left. There were dishes in the sink and personal items scattered around the cabin. The presence of two live-aboard cats was obvious with fur and fluff everywhere, but beneath the surface was an as-new yacht. The first task was to complete installing a new raw water impellor that the previous owner, George, had attempted but failed to complete. Then, with a hose brought in through the cockpit and run into the raw water strainer, we hit the start button. The engine fired on the first stroke and spat out the remains of a bird's nest in the exhaust onto the hard beneath the hull. A quick check of the engine remotes and we were ready to put the boat back into the water and motor her as far as the fuel dock. The owners had had the presence of mind to remove the sails from the spas and take down the canvas dodger and bimini before bolting and these items filled the aft cabin. The next morning the travel lift arrived on schedule. It was a moment of trepidation and excitement as Nereid was returned to the water after a year on the hard. The boatyard was 10 miles up a shallow channel and we waited for the tide before slipping the boat into gear and motoring cautiously down a narrow two mile channel marked with sticks. The depth sounder showed zip beneath the keel and we touched three or four times before we broke free into navigable water. The trip down river provided a chance to run up the freezers and test out other systems. Surprisingly, everything functioned normally. Tied alongside the Abhorroa boatyard in central La Paz, I spent the next three days with a hose, bucket and scrubbing brush taking years off the boat. By the end of the week I had a second-hand yacht that looked, felt and smelt like a brand new boat. All that time sitting under the burning Mexican sun had done in the antifoul…and the batteries…so after negotiating a price for a full hull scrape, epoxy barrier coat and three coats of new antifoul, the yacht was hauled again and the hard work began. With a Mexican army of workers, the jobs - including a topside, cockpit and deck wax - were carried out with care and attention and five days later I was back in the water - all for less than the cost of an antifoul back in NZ. Curiously, the boat hadn't been fitted with an electric auto-pilot and I'd ordered a new under-deck pilot from Raymarine, along with a new large-screen chart plotter/radar and membrane for the water maker. Fitting the pilot required getting stainless steel brackets fabricated at a local machine shop. Equipped with my Spanish phrase book and simple line drawings, the work was done on the spot and everything fitted like a glove. The wiring was already in place so connection was straight forward. Within three days the pilot was ready for sea trials, and with the help of another yachty, we cast off for a spin down the narrow La Paz channel. Everything had tested okay at the dock but the pilot didn't want to know at sea. We tried everything but it kept failing. I was skeptical about the system from the outset. It was supplied without a rudder follower, which the manufacturer assured me was unnecessary, claiming the new generation of pilot was too intuitive to need one. Whatever! Beside myself, I brought in the local electronics guru - an accredited Raymarine installer - who went through the wiring and installation. He couldn't find anything wrong and accompanied me out for another set of sea trials. These went the same way as the first - fail, fail, fail. His only advice was to send the unit back to West Marine in San Diego and get a replacement. This would have taken weeks, perhaps months, given the delay getting goods through customs in Mexico. There simply wasn't time. The only option was to remove the unit and fly to San Diego and persuade West Marine to replace it. But I didn't want to return with the same unit. A pilot needs a rudder follower and I had no faith in the model I had. I wanted a Simrad AP24 that I was familiar with and trusted. It wasn't easy persuading West Marine that the Raymarine didn't work 'out of the box' and my face turned blue before I finally walked out with what I wanted. I haven't looked back since. But all of this had taken a big bite out of my schedule - and my wallet. It was not unreasonable, I thought, for sailing mates to lay down their tools and fly to Mexico to sail the first leg to Tahiti via the Marquesas, a commitment of about two months. I was wrong. They were keen; their wives were not. I received a string of emails from mates - all with words like 'divorce', 'separation' and 'chastity'. I was on my own. This wasn't ideal and I put an 'all points' out for available crew in La Paz. There was lukewarm response from a few aging hippies with no sailing experience and a tentative enquiry from a 48-year-old woman in the US looking for sea time to qualify for an offshore ticket. I signed her on and she arrived at the boat a week later ready to go. 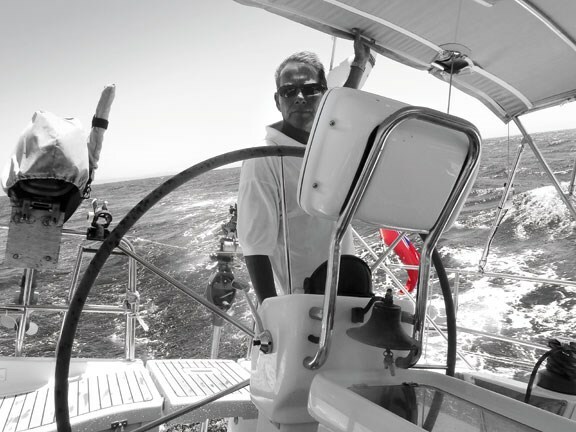 After a quick provisioning, we threw our lines and headed south to Cabo San Lucas. I hadn't sailed the yacht yet but with hurricane season snapping at my heels there wasn't time and I figured the 200-mile passage south would be a start. We didn't have a breath of wind the whole way. After stopping to refuel and check out with the Mexican authorities, we set off again, running head-long into a near gale south of Cabo. It was not ideal conditions for 'learning the ropes' and my crew disappeared below decks at the first hint of spray across the deck. With a deep reef in the main and a sniff of furler, we punched on but the rig wasn't happy, inverting above the forestay. With my limited rigging experience, I went forward with spanner and screwdriver and tightened the cap shrouds and then the lowers. A little improved, I was still apprehensive, given the loss of two rigs at sea over the years. Our course was taking us north of the rhumb line to avoid a low-pressure system that had developed south of us. The forecast was for 30 knots easing over the next 24 hours. My crew hadn't emerged from below for several hours and I began to have some serious doubts about crossing 3000 miles of Pacific Ocean with no time on the boat and a coastal sailor for back up. I was also now rushing and behind the eight ball. After a long talk with myself, I decided the sensible thing to do was put the boat about and return to port, park it up for the Mexican summer, and return in December. This would give me three or four months to get really familiar with the boat before striking out for home. Hopefully, too, I could secure one or two experienced sailors to join me. So here I sit, back where it began just under a year ago. The jury is still out on the crew situation but we're about to head out and start putting miles under our keel sailing the Sea of Cortez.